Brian Colin is a veteran Video Game Designer/developer with over 32 years in the industry and over 90 titles under his belt, including some of the most-popular, highest-earning, best-selling, video arcade games of all time! 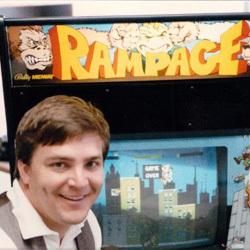 The designer of the groundbreaking RAMPAGE arcade game, Brian has also designed or contributed to numerous classic and modern games such as XENOPHOBE, SPY HUNTER, ARCH RIVALS, DEMOLITION DERBY, ZWACKERY, PIGSKIN, GENERAL CHAOS, RAMPAGE WORLD TOUR, STAR TREK VOYAGER, THE MUNSTERS, THE KOMATSU CHALLENGE, RAIDERS RUN… and many, many more. As CEO of his own independent game development company, Game Refuge Inc., Brian continues to create original, innovative gameplay experiences for players the world over.